Where do you turn when you or a loved one need specialized care such as prescription delivery, oxygen and hospital grade equipment? At HCA Pharmacy & Medical Equipment we have been Winchester and Clark County’s reliable source for health care that exceeds expectations. That’s why we say we are big enough to serve, but small enough to care. HCA Pharmacy & Medical Equipment has been serving Winchester since 1982 (formerly Home Convalescent Aids). Since that time we have become a trusted member of the healthcare community for all needs, great and small. Our business has been accredited by the Joint Commission, which means we have undergone thorough examination of our products and procedures to provide you with the care you need. Tired of being put on hold for minutes on end? Want to speak to a person instead of a machine? Want your pharmacist to know you by name when they see you? At HCA we take your health care personally and we value your time and your business. We will work with you to make your health the best it can be. Our patients love that we know them by name and they can call on us at any time day or night if needed. At HCA we are members of the community and your support helps our community and keeps money and jobs in Winchester. Since we are locally owned and operated we have the power to help think outside the box to help patients maintain their health. 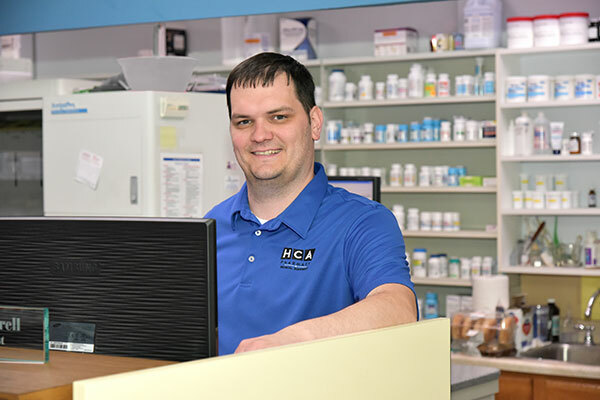 Jamie Ferrell, PharmD has over a decade of experience in indepedent pharmacy and looks forward to earning your business and proving why we say we are big enough to serve but small enough to care.